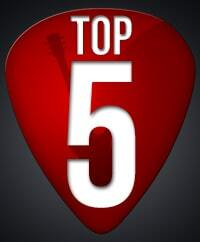 Hi everyone, welcome to this month's newsletter on the most watched guitar lessons on TheGuitarLesson.com. So anyhow, if you're learning guitar, it's nice to know what your peers are learning as well, it's the social aspect of things. Knowing what others are up to can give you a motivational boost to learn these songs as well, so let's not waste any more time. Here are the most watched lessons from the month of October. As a side not, Love Me Again did not make this month's list, which is a shame. It's a new lesson, so if you like John Newman, check it out. Santana is really a one of a kind guitarist, and person. I follow his Facebook channel, and the poems he publishes never seize to amaze me. A true artist/guitarist. He doesn't sing, but boy, can he write. It's interesting that he always publishes his poems in Spanish as well as English. I wonder which one comes first, and which one is translated. You Never Can Tell is one of Chuck Berry's most famous hits. If you like it, you should definitely learn more of his songs, such as Johnny B Goode right here on TheGuitarLesson.com. Chuch Berry is the father of rock & roll, so learning to play his songs is a must for any guitarist. This lesson is always in the top 5, so this is definitely one of the most lessons on the site. Ever. With good reason actually, since it's fairly easy to learn if you've been playing for a few months, and it sounds terrific. It actually sounds much harder than it actually is, which is why I think so many students love this lesson. Ace of Spades was a new lesson in the month of October, it's one of the best hard rock songs ever made. I remember being younger, I was just listening to it on repeat for days when I discovered it. I still love the song, and hope you will as well. It's a harder song to learn because of the speed, but if you do, you'll have advanced your plucking speed a lot. This is another new song from last month, an acoustic strumming song utilizing all barre chords. This means it's not for beginners, it's for everyone who wants to perfect their barre technique, or just learn a really fun song. I hope reading this article has inspired you to pick up your guitar right now, and learn one of the songs above. Have fun!